In 2011, the Setalla family was inducted into the Arizona Culture Keepers Hall of Fame at the Kierland Resort in Scottsdale. Arizona’s State Historian, Marshall Trimble was the host. The Hopi pottery tradition began hundreds of years ago, passing from one generation to the next. So it has been with the Setalla (Navasie) Family. Pauline Talasyousia married Justin Navasie Setalla, and Pauline learned to make pottery when she was immersed in the Navasie family. As their children arrived, they were also immersed in pottery and for some of them the tradition stuck. Pauline had an opportunity to learn from the best. 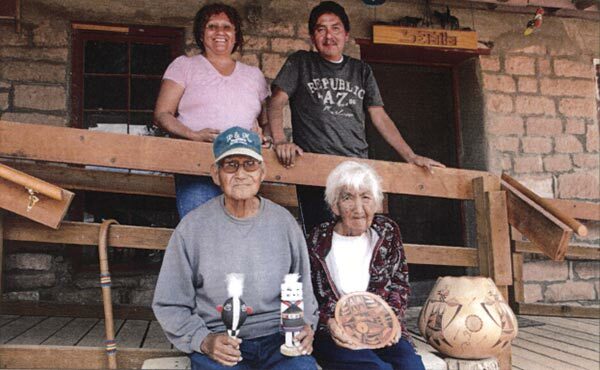 The Navasie family has been famous for their traditional Hopi pottery for generations. They taught her where to dig the clay and how to process it, how to prepare the paints and draw the traditional designs on the pottery using a yucca brush. They also taught her how to shape the clay into beautiful shapes and fire them with sheep dung. Justin and Pauline’s children grew up watching their father carving beautiful katsinas and rattles while learning Hopi traditions from his stories. They learned to make pottery from their mother, aunts, and grandmother, shaping little circles of clay on their knee in exchange for a piece of candy. From this humble beginning grew the rich tradition of the Setalla’s pottery. Many of their designs come from the old pottery shards found in the abandon villages of Awatovi and Kawikaa. Corn, clouds, rain, parrot and other bird designs are the basis of their unique deigns and styles. Each of the family members’ pottery reflects their own personal style and desires of the Hopi pottery tradition. Pauline is known for her polychrome wedding vases, traditional style piki bowls, and water canteens. The thinness the coiled pots, the use of traditional pigments, and dedication to traditional Hopi designs are her hallmarks. Her techniques and methods were passed on to her children, Dee and Gwen Setalla. Dee’s pottery reflects his desire to remain true to his Hopi heritage as he continues to follow the traditional techniques. His skill with the clay results in some of the larger Hopi pots, a very difficult skill to master with ground-fired pottery. Gwen does very fine-lined designs that complement her beautiful yucca-handled canteens and wedding vases. She is particularly skilled at making large, flat tiles with beautiful bird and animal figures. Dee and Gwen share a strong commitment to preserving the traditional Hopi pottery, and they continue to teach through pottery demonstrations and lectures given throughout Arizona and the surrounding areas. Gwen works as a ranger at Homolovi State Park, educating people in the Hopi ways traditions. The Setalla Family’s pottery is found in a number of prestigious museums, including the Smithsonian Institution, Peabody and Heard Museums.